Includes a whole range of interchangeable parts and accessory for customization ! Accurately recreated from its appearance in the series, you can now build your own Test Type-01. The Test Type-01 consists of 330 pieces and features 60 points of articulation to allow for creation of your own custom poses. Standing 21 cm tall in 1/400 scale, this plastic model kit makes a great addition to any display. 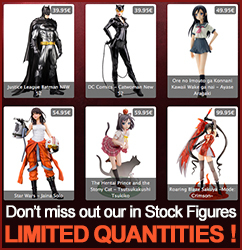 Display alone or alongside other Evangelion plastic model kits or Ani Statues from Kotobukiya !